The Agilent 5350B provides fast and precise measurements from 10 Hz to 20 GHz and features microwave components that are integrated on a single hybrid gallium arsenide (GaAs) circuit for added speed and reliability. The 5350B distinguished by wide frequency coverage, exceptional sensitivity, fast tracking, high measurement throughput, and wide FM tolerance. Built-in microprocessors provide math functions, including measurement scaling and offset. 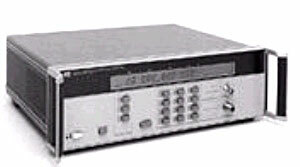 Automatic amplitude discrimination measures the frequency of the highest-amplitude signal in a multi-signal environment. A full set of diagnostic routines provides general information and troubleshooting. The 5350B integrates easily into test systems. English-like commands simplify integration with other components, and the easy-to-read liquid crystal displays can serve as message centers for the system. Features: Frequency range from 10 Hz to 20 GHz; directly measures without expensive mixers. Sensitivity to -40 dBm ensures accurate measurement of low-energy signals. Low kickback noise for sensitive environments; sleep mode reduces noise to -70 dBm. Fast acquisition time (60 ms in automatic, fast acquisition tracking mode; 20 ms in manual mode) for improved throughput. Up to 120 measurements per second (100 in automatic mode) over HP-IB (fully programmable). Fast tracking speed allows effortless tracking of source drift to 1 GHz per second; ideal for measuring the response of voltage-controlled oscillator to voltage-source tuning.